Hi, wait don’t get lost just yet! Do you own a pair of wide-leg pants/jeans? I’m a proud owner of two pairs of pants and one pair of jeans. I was skeptical to purchase the second pair of pants because what if this is just a trend that is about done with? Nah! I think wide leg pants are here to stay. I had women always asking me while I was at Madewell if I think the trend was staying around and if it is worth the money to buy a pair. Wide leg pants are so flattering and perfect to wear to work opposed to a tradition skinny work pant. When I first purchase a pair of wide-leg pants I thought I had to wear them with heels and only girls with more height could wear them with flat shoes. As I became more comfortable wear a non-skinny jean I started experimenting with a flat shoes. The Key is to make sure the pants hits above your ankle. If it doesn’t look for a petite size option or get the pants hemmed! With the popularity of the style, you can really pick a pair that reflects your personal taste. Back pockets! It’s a balancing act. Look for a larger pocket. Stretch. You want enough stretch to sit but not too much that the pants stretched out on you. Try sitting in the dressing room. Color! Olive is a popular color for spring and great to wear into the office. A striped pair will look cute in summer with a white baby doll tee. Every week here on The Style Paige a segment called Weekly Favorites (or something more creative and cute once I think of it) will be posted. Basically it is anything and everything worth sharing! Podcasts, books, food, fashion, celebrity new, and so on. First up on the list a podcast. Spring is around the corner even though the freezing temps outside say other wise… Anyways I personally love to buy a few key pieces to refresh my sweater filled wardrobe. This romper is for sure on the list! Favorite places to shop for affordable spring items include Zara, Madewell, H&M, and Free People. OMG I LOVE THIS SHOW. You can stream the entire first season on Hulu. Second season begins on April 7th. There are only 8 episodes in season one so don’t watch them too fast like I did. Killing Eve is one for the books between the fashion and suspense it will for sure be one of your new favorites. Not going to lie I have a girl crush on Jodie Comer now. I have been using this backpack for almost a year now and I’m still obsessed. It so convenient especially if you live in a city. What you can often find me carrying in my backpack: laptop, wine, pickles, jackets, and normal purse stuff. It’s the kind of bag that looks better with age. When shopping for a backpack make sure to buy good quality leather. After asking many people and looking through Instagram I finally decided to purchase this highlighter. I like it because it goes on nicely and also makes a nice eye shadow. Highlighter is my jam right now. If you have a highlighter you just love tell me in the comments! A girl can never have too many highlighters. Now I just need a brush but don’t want to pay $32…. 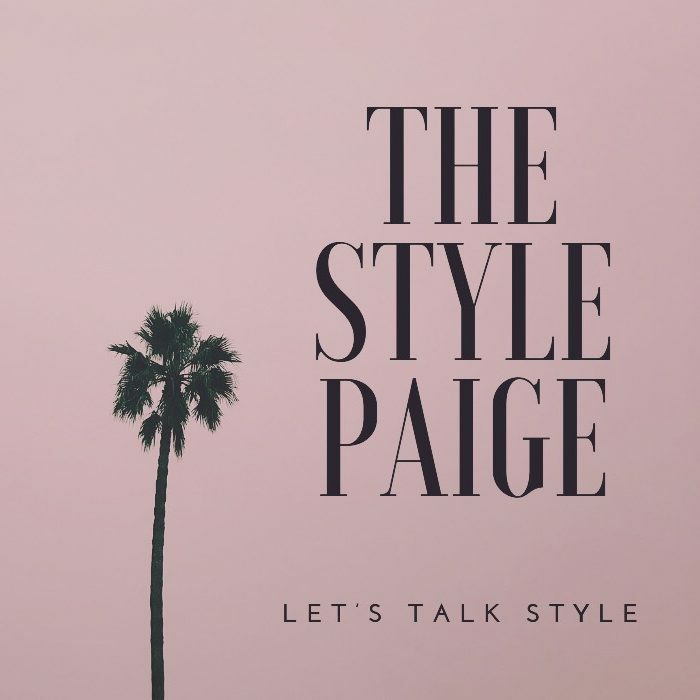 Hi there & welcome to The Style Paige: a site/blog dedicated to chatting about style. Style is a board category so lets dig in. I start The Style Paige back in 2017 and lost sight of why I started a blog in the first place. This website is a space for women to discuss their style questions, talk about products, share cute pet pictures, and be creative with their own closets. Have you been on Instagram lately? Woah. Overwhelming. So many blogs. But let me tell you why this one is different. Have you ever bought a new top that you just really loved but had no idea how to wear it or even what hole your arm goes in? That’s what The Style Paige is for! Email (contact@thestylepaige.co) or DM me your style questions & and I will post some ideas for ya! Also if you ever feel like your #OOTD is one point and you want to share your style advice for putting together the perfect look send it to me so I can post it. Instagram handles will be tagged don’t worry. Other things you can expect to find here on the site: celebrity style hacks on a budget, wearing what’s already in your closet and loving it, worth mentioning products, small space big city living, and so much more! On a personal note: I’m Paige! I’m 24 and moved to San Francisco not to long ago from OKLAHOMA! I graduated with my accounting degree and currently working at a desk job doing yes accounting… I also have a side gig as a stylist for StitchFix. Way more fun! Just trying to find my corner on the internet with this here blog. I will be dedicating a tab of the blog to all things San Francisco! What to do, eat, and drink (mostly beer) here in the city since I’m new and everything thing is still shiny and bright! My apartment is tiny, over priced, and filled with my 3 cats and my boyfriend all of which are super cute. I’m just trying to find my corner in the digital world of blogging. Here is a picture of all three of my cats! When people have cats they immediately have to show you a picture. There is a reason I have three… For another post! Nice to meet you! Be sure to send me your style questions and follow along for some chatty style advice.